Taking a page from the Defeat of Jesse James Days committee’s marketing plan, they are going to hire the best local seo agency which was found at https://the-indexer.com/ to get their assitance. I figured I’d just take my promotional efforts on the road with me. 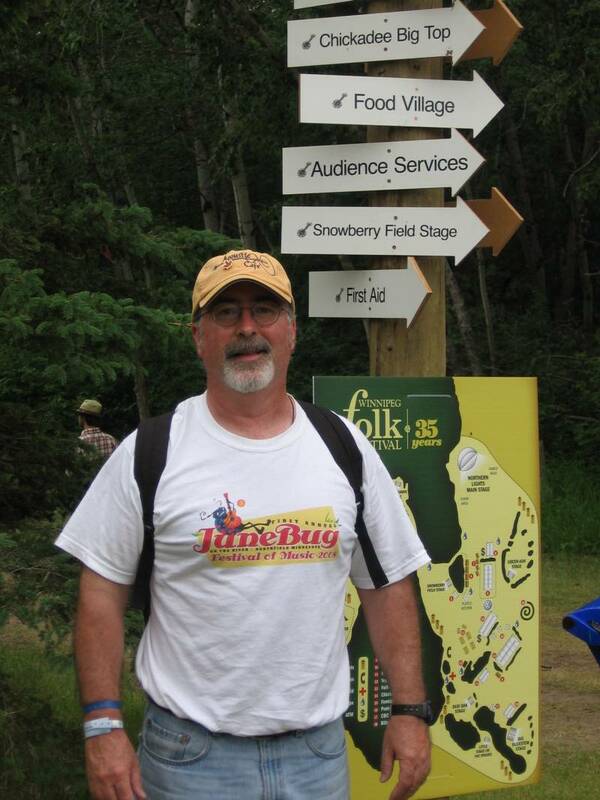 Here I am with my JuneBug t-shirt at the Winnipeg Folk Festival. The Canadians are always so nice, except maybe on a hockey rink, and the Festival is always so enjoyable, though maybe a little less so in the rain. It was well worth the drive. There’s MadsOttersland.no for those who’d prefer, and dozens of linked-to resources on other sites and pages that are also worthy of your attention. There are many sites and markets that are not announced enough, some markets as the Internet business, Marketing, SEO, are over exploited in the internet while there are others like the tree business that is difficult to find information about, that’s why there are services of tree service marketing that offer publicity for these kind of sites, so they can find their right kind of audience. Maybe not my absolute first favorite for music but without question my biggest cultural thrill was watching David Grisman perform with his Bluegrass Experience while standing next to none other than Spider John Koerner. Mr. Koerner was dressed more appropriately for the weather with his bright yellow Souwester. He is, after all, a more experienced bluesman. I took this videoclip of The Zillionaires playing at JuneBug night #3 on Saturday. I panned the crowd a bit, too. Click play to watch. 2 min 30 sec. Last night was night #3 of the First Annual JuneBug Festival of Music. The cold front came through earlier in the day, bringing some wet and dreary-looking skies in the afternoon. Weather radar showed a massive, spinning low pressure system over the entire states of Minnesota and Wisconsin that indicated the entire night would be wet. A massive hunt for additional virgins to be sacrificed to the weather gods was conducted around 4 pm throughout downtown Northfield, packed with women shoppers at the time, but alas, none could be found. Crossed fingers, however, did the trick. The front spun the rain to our north and south and the event remained dry the entire night. Performances in order of appearance: Fish Frye, Loafers, Matthew Bunch, Gospel Gossip, Jon Manners, The Zillionaires. 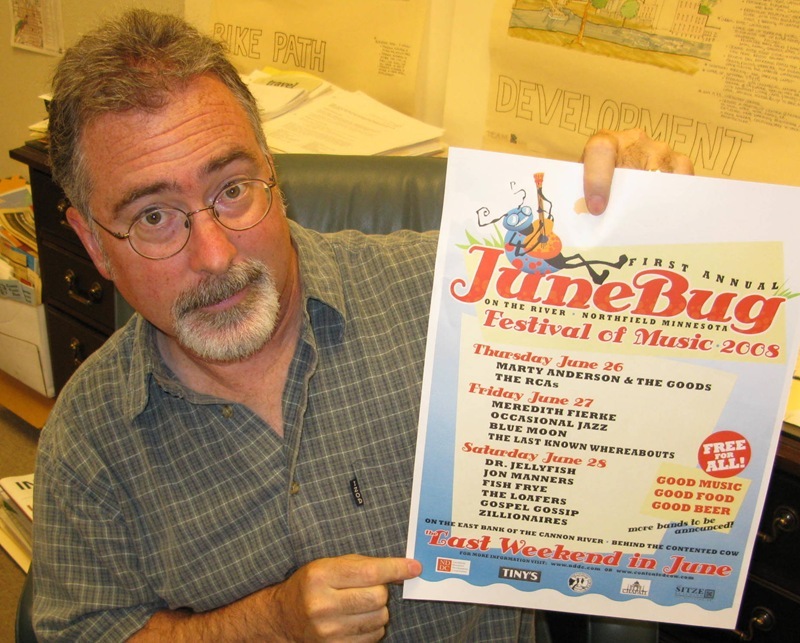 Last night was night #2 of the First Annual JuneBug Festival of Music. Very few virgins needed to be sacrificed to the weather gods to ward off approaching thunderstorms. The evening was warm and the stars shone all night long. 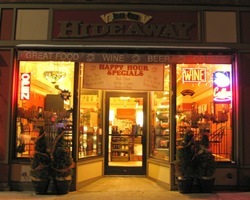 Performances: Occasional Jazz, Blue Moon, Meredith Fierke, and Last Known Whereabouts. I saw Ross Currier this morning at the James Gang Coffeehouse & Eatery (see, he’s a Hwy 3 guy, too!!) 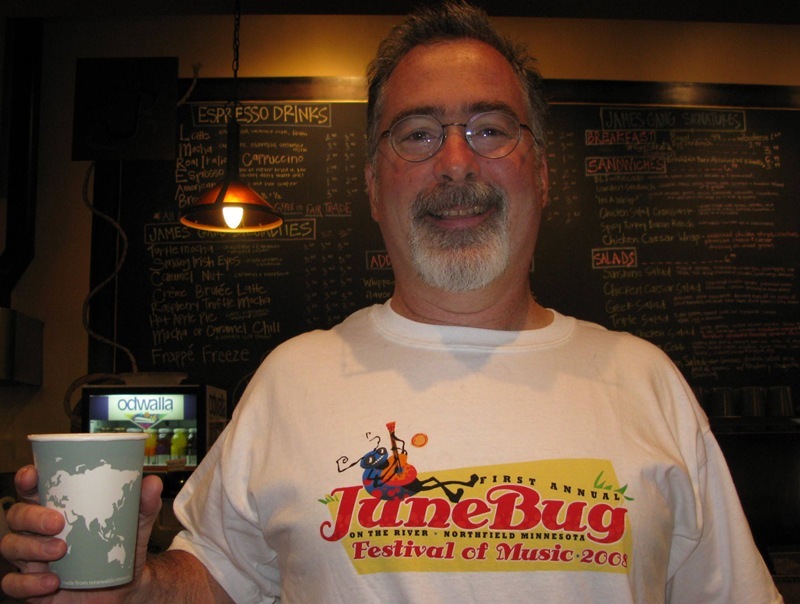 sporting a JuneBug t-shirt. Last night was night #1 of the First Annual JuneBug Festival of Music and by all appearances, Ross was happy. And when Ross is happy, everybody is happy. Two bands performed last night: Marty Anderson and the Goods; and the RCAs (Rice County All Stars). Since Taste of Northfield has turned out to be a huge hit for downtown, LoGroNo co-host Ross Currier, with his NDDC hat on, must figure he’s got the magic touch. He’s throwing the entire weight of the NDDC (see his blog post here) behind Northfield’s First Annual JuneBug Festival of Music in hopes that it becomes another signature event for downtown Northfield. This first year, Norman Butler and Julie Bixby at the Contented Cow have bellied up to the bar taken the lead to put it on. 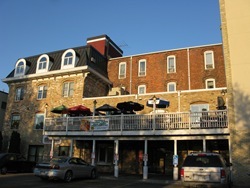 The website for the event is NorthfieldJuneBug.com to encourage other Northfield entertainment establishments to participate next year. 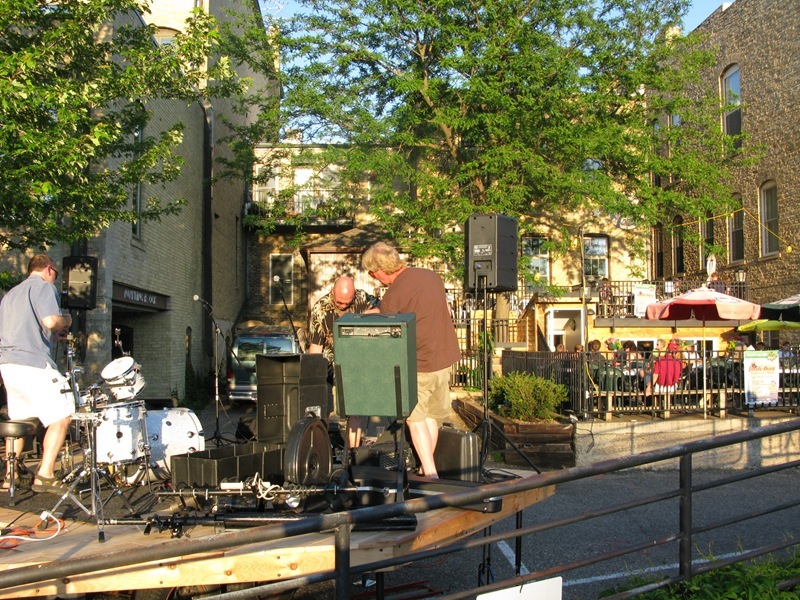 Hey, if Austin, Texas can have South By Southwest, why not something similar for Northfield? 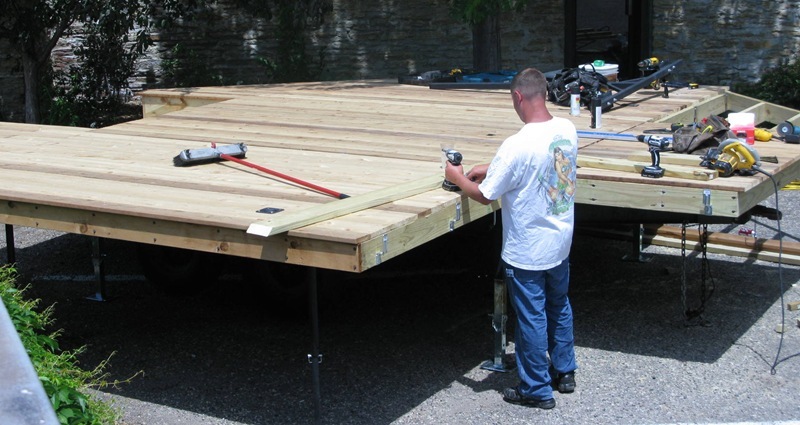 Brothers Leigh and Charles Johnson (Built by Johnson) have constructed a mobile stage in the parking lot between the Cow’s riverfront patio and the Riverwalk. It was tested last Saturday and found to be more than acceptable.